Kyle in such a pity state at the hospital. Being a mom calls for a 24-hour duty, seven days a week. It’s a job that doesn’t pay, and quitting is not an option. But then you are rewarded with hugs, kisses, and smiles, and you are inspired to be the best mom ever. But being a mom includes more than reading the same story come bedtime. It takes more than that. If you’ve been blessed with a child with special needs like Kyle, to say that each day is a challenge is an understatement. Naturally curious and playful, children will go traipsing in the mud and try to fit their small figures into even tinier spaces, scoring some scrapes and bruises in the process. Kids are prone to bruises and scratches, with all the running and playing they do. Thus, it is inevitable that your child might scrape his knees once in a while. They say it’s all part of growing up. As much as parents would want to watch over our child’s every move to make sure he is safe and healthy, it’s just not possible. Kyle's elbow suffered from scrapes and cuts. As parents, we try to do everything humanly possible to protect our kids. Yet, as I had to learn the hard way that fateful day, you can never be too careful. Tragedies happen and it is something that we can avoid if only we don’t take our eyes off our children especially when they’re very young. But nothing can really prepare you for the worst parenting scenario, especially if it involves your child weeping in pain. It’s hard to see your child cry. It’s even harder when his tears are caused by a painful discomfort he had sustained from a vehicular accident he got into that you simply couldn’t do anything to take the pain away. When he starts wailing hysterically, you lose focus and find yourself in disarray—leaving the problem unsolved. So you could just imagine the scenario I’ve been through exactly three years ago. Yes, folks. If you’ve been an avid reader of this blog, Purple Plum Fairy—I’ve shared so many times how I felt that dreaded day when we almost lost Kyle. Kyle's left foot after the accident. Kyle was an eight-year-old keg of dynamite. He’s got Attention Deficit Hyperactivity Disorder (ADHD). So he was really what you could consider malikot, fearless, and will almost try anything. He’s a child with so many quirks but he’s adorable on his own right. I had been giving repeated reminders and warnings on what may happen if he’s not careful especially when crossing the street. That fateful day (when the said vehicular accident happened), I even left him a note reminding him not to go out of the house. I just needed to do an errand so I left him with one adult relative who was supposed to look after him. Apparently, Kyle had been asked to buy an ice pop by my teenage cousin, so off he went out while wearing a Jabawockeez mask (he’s supposed to wear that for a dance at school). And that’s how an FX hit him. It’s such a harrowing experience for both Kyle and I. I was in tears, seeing him in such a pity state. It was truly heart wrenching. The wounds on Kyle's thigh taken at the hospital after the accident. I’m a safety freak—probably one of the most overprotective moms you’ll ever meet. Even if Kyle’s a boy, I’d generously slather anti-repellant lotions on his body just to make sure mosquitoes wouldn’t bite him. I’d have alcohol, wet tissues, hand sanitizers etc. to make sure he’s germ and bacteria-free. So it wasn’t surprising that Kyle used to possess flawless skin. But this vehicular accident had made him suffered not just bruises, cuts and scrapes but also avulsed wounds (meaning unskinned and exposed wounds) on his left foot. Exposed skin and avulsed wounds were more prone to harsh bacteria and susceptible to further infections due to heat, dirt, or pollution which maybe more risky for him. I thought he’ll not be able to walk again, so it was such a relief on my part that there were no fracture. By the time his wounds were about to heal and he’s grown back his epidermis, his wounds had become more dry, flaky and itchy. I was worried how his left foot would be like because it had actually looked like web’s foot after the accident happened. A child’s skin is said to be 40 % thinner than ours, so it is sensitive to chemicals and prone to moisture loss. I had to be careful whatever it is I put on Kyle and I had to make sure it has no harmful ingredients that can further cause dryness. His doctors recommended that we use Contractubex. We used Contractubex on his scars for about three months. Creams can make kids feel sticky and uncomfortable. Personally, I like Contractubex because it comes in a clear transparent gel. It provides gentle and effective relief to Kyle’s scars plus it seems to lock in some moisture without the greasy after feel of other ointments. Contractubex coats the skin leaving it somewhat moisturized. Formulated with Allantoin, Extract Cepae and Heparin Sodium, these are meant to keep unsightly scars less noticeable. My scar is nearly invisible after regularly using contractubex. I even tried using Contractubex myself on a scar I had acquired through burns from baking as a pastry chef. Amazingly, it had become less visible. 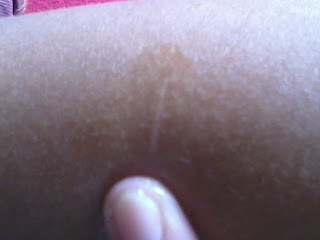 Yes, my scar is nearly invisible, as you can see on the picture above. 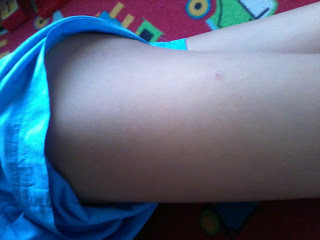 Note too that my son's scar from the same thigh where he had his wounds is seen below without any visible scar. Note that this is the same part in Kyle's thigh pictured above. 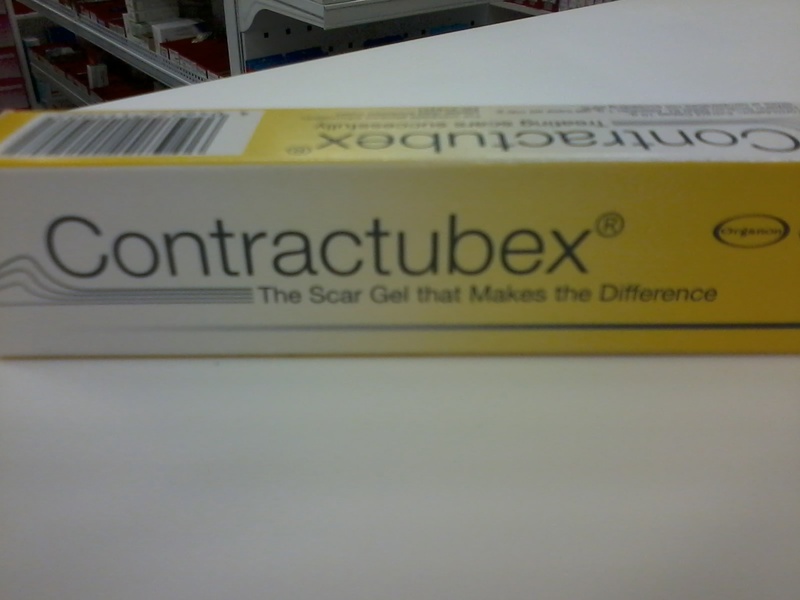 Contractubex prevents excessive scar tissue leaving the skin more resilient. We noticed that it had truly helped reduced redness, itching and the felling of tension on Kyle’s scars. 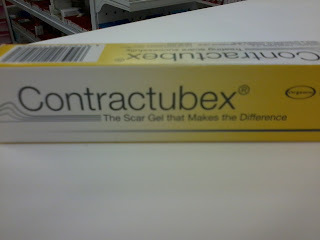 Contractubex was such a great help in alleviating dryness on his scars. It makes the scar smoother and improves his skin’s elasticity. It dissolved bruises, soften scars, reduces healing time, lessens swelling and it makes scars less visible. Soon enough, Kyle’s scars on his upper thigh and elbow seemed to have totally vanished. He also used to complain about the scar on his left foot for being itchy and he was ashamed of his scar. Had it not been for Contractubex, Kyle wouldn’t be convinced to wear his slippers again. And in doing so, he got his life back and was able to be fully recovered. Three years had passed since it happened. Now eleven-year-old, Kyle luckily has moved on from that traumatic incident. He’s been very active in sports lately: he’s a badminton varsity in school and trains with the Marilag Futsal Team twice a week. We did not resort to skin grafting because it was pretty expensive. He’s wound has turned into a keloid. 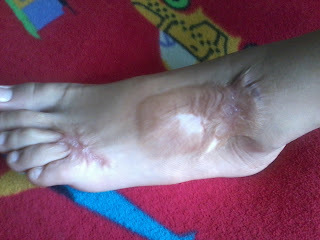 Thus, the remaining scar on his left foot will forever serve as a reminder for him to be more careful. But if he’s wearing a shoe, nobody could have guessed what Kyle’s been through because his other scars had been less visible, some luckily had totally disappeared. All of these, Kyle owes to Contractubex. Kyle's left foot with the remaining keloid. Nothing in this world is perfect or fail-safe. Our journey may be fraught with a lot of obstacles, heartaches even, but for as long as we have each other, we will prevail. Although each day unfolds unpredictably, knowing that we are constant in each other’s lives gives us confidence to live through it. Disclaimer: I am not paid to write this blog. Opinions are 100% my own. Sobrang effective pala nyan. Baka naman mahal. Is it expensive? But this one's better than having your scars laser. It looks pretty effective. I wonder how many times you have to use it. But judging by the photos, it did made the scar less visible. Great product! Have used it already..This could actually erase jelly fish scars as well. 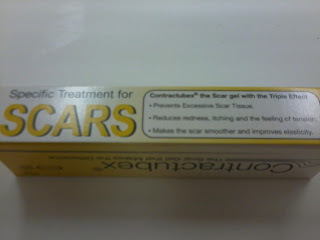 Thanks to Contratubex..
Pwede pa palang mawala ang isang old scar using this product. Nice one. I never knew it was possible Thanks for sharing. Science has greatly improved. 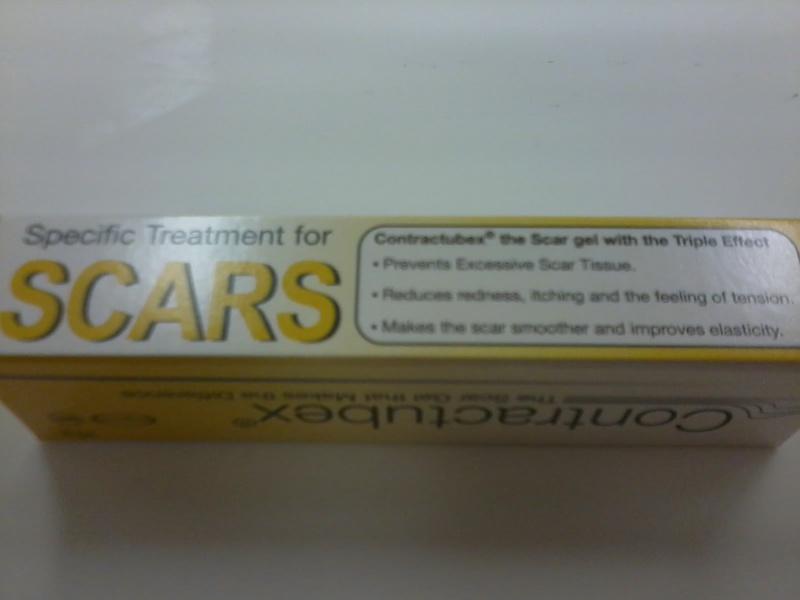 There are now products that are indeed affordable such as this anti-scar product. The best thing about this is it is really safe and effective.